Lil Sullivan’s life was changed by a stroke at the age of 49. Like many strokes, Lil’s happened without any warning, one day in summer 2005. Katherine Woods finds out about how Lil has adapted to life after a stroke, and takes a look into our stroke research. Lil’s stroke was caused by a burst blood vessel in her brain – known as a haemorrhagic stroke. A few days after, she had surgery to repair the burst blood vessel in her brain and stop it from bleeding again. During the operation she had another stroke and was put into an induced coma. She had intensive physiotherapy to regain as much of her strength and mobility as possible. She learned to walk and talk again, but her stroke has left her with weakness on the left side of her body and a tremor in her right hand, as well as affecting her speech, vision, thoughts and memory. Lil's daughter t'lda (left) and other family members have been a great source of support. Adapting to a new life Lil needs help with daily tasks, such as cooking and cleaning around her home in South London, where she moved 26 years ago from County Kerry in Ireland. Lil’s 18-year-old daughter t’Ida, who was only five at the time of her stroke, does the cooking at home and her older daughter Sadb, 35, and sister Medg help out too. “I’m so grateful and blessed with my family – they rallied around to help me,” Lil says. She also has a carer who comes every day to make her breakfast and do some cleaning. Now 62, Lil still writes songs and does art nearly every day, but says life has changed a lot since her stroke. Lil is performing in a play too, called Stroke Odyssey, with three other choir members. She’s proud that she’ll be performing one of her own songs in the play. Watch our video on why we care about stroke. Read three more inspiring stories of people recovering from a stroke. With BHF funding, stroke expert Professor Philip Bath is testing a new way to improve outcomes for patients. "After a stroke we know it's important to lower a person's blood pressure as quickly as possible to minimise long-term damage. This begged the question: can we get blood pressure treatments to patients even sooner, in the ambulance on their way to hospital? Professor Bath has tested a patch that delivers the drug glyceryl trinitrate (GTN), which relaxes and widens blood vessels, through the skin. He is now testing this in a trial involving over 1,000 stroke patients. Paramedics apply the patch to a patient's skin on their way to hospital, where it is then replaced every 24 hours for three days. The study will look at whether stroke patients given the patch had better outcomes than those given a placebo patch. "The beauty of the treatment is that it's easy to use and costs just 39p, so if the results are positive, it could be applied to help patients around the world - not just in high-income countries." 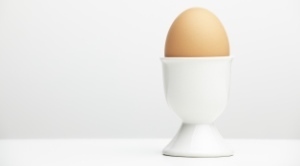 Can eggs reduce stroke risk?